New 7 Wonders of Nature Nominations to Close in 3 days; Philippines Tops List | Let's Go Sago! Even with 3 more days remaining for the New 7 Wonders of Nature nominations, Puerto Princessa Subterranean River in Palawan is almost as sure to be the Philippines’ natural site of choice to vie for a slot in the New 7 Wonders of Nature. As of December 27, the Philippines tops the list with Puerto Princesa Subterranean River at Rank no.1 beating Vietnam’s favorite Ha Long Bay and other prominent spots around the world including China and Nepal’s Mt Everest at 13th place, South America’s Amazon River at 19th and Japan’s Mt. Fuji at 23rd. Surprisingly low ranked are USA‘s Grand Canyon at 35th place, Australia‘s Great Barrier Reef at 41st and the Maldives archipelago at 65th. You still have a few days to vote as nominations close on December 31, 2008. Each person must cast 7 votes from among the nominees from the 6 continents of Africa, Asia, Europe, North and Central America, Oceania, and South America. 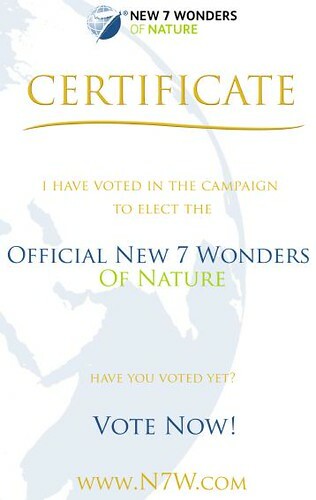 Vote now and download the free New7Wonders of Nature voting certificate. China came next with 5 locations namely: Mount Everest (13), Yangtze River (24), K2 Mountain (26), Huangshan Mountain (50), and Wulingyuan Rock Formation (69). China shares the first two with Nepal and Pakistan, respectively. Australia follows with 4 locations. With 3 locations each are Bangladesh, Bolivia, Venezuela, and fellow south east Asian neighbors Indonesia, Thailand, and Vietnam. Voting will be on hold from January 1 to 7, 2009 as the results of the qualifications per country are verified and calculated. The leading national nominee per country will then be announced on the site on January 7, 2009 when voting will resume. With a necessary Official Supporting Committee, voting continues until July 7, 2009 of which the Top 77 will be considered by the New 7 Wonders of Nature Panel of Experts for shortlisting of the selected 21 28 finalists. The panel is led by UNESCO Director-General Prof. Federico Mayor. From the 21 28 candidates to be announced on July 21, 2009, the long and final votation based on popular vote will then commence and continue until 2011 when the New 7 Wonders of Nature will be declared. For FAQ on N7W, click here. * All list and statistics are based on New7Wonders.com’s 27-DEC-2008 23:00 GMT last update of the Top 77 list. ……….hahahahaha im proud to be filipinoi……. im proud to b a filipino!!!!!!!!!!!!!!! !